With Easter just ten weeks away, plans may be underway for your annual production. Easter presents an opportunity like no other to present the Good News to those who don’t regularly attend your church. The right Easter program helps your congregation celebrate the Resurrection and embrace and invite your surrounding community. Finding the right production for your church requires earnest thought and prayer. Here are a few ideas, guidelines, and thoughts to help you navigate the process. The perfect production for your church may not be the most elaborate, but it will be a reflection of your congregation’s culture and style. You want a production that is accessible, uplifting and accurately portrays Easter as the celebration of our Savior. PROS: A drama can be a very moving and rewarding production to perform, it can appeal to a wide range of tastes while offering a special chance to connect with those in the audience who are not believers. PROS: If you have a seasoned team of musicians and singers, a musical can be a great entry point into dramatic performances. The right musical can stir a wide, dynamic range of emotions that non-musical performances cannot. The majority of the rehearsal time could be done during your normal practices. If you already have a thriving and dedicated worship team, you won’t have to look far to field a full cast. Does it fit your church? PROS: An interpretive or “hybrid” concert/drama is essentially a collection of seasonal songs with spoken word passages between songs or portions of songs. There are many programs available for purchase or you can add your own flair to the process and put together a collection of songs and write spoken word passages (or simply read directly from scripture). Many churches are choosing to go this route as it can be quite moving while simplifying logistics and budgeting issues. It also gives those who cannot usually participate a chance to join in. CONS: One of the few drawbacks to this format is the ease in which people can become involved. You’re probably asking yourself, “Why is that a problem?” Even if you have eight or nine different spoken word passages in your program, you may have 40 or 50 people in the congregation interested in participating. This is where your tact and discretion as a leader is required. Use this as an opportunity to include new faces on the platform. Timing is everything—your program will run longer live than your original plan provides! Don’t force everyone to memorize their lines or Scripture verses. Fluid delivery is more important than memorization. 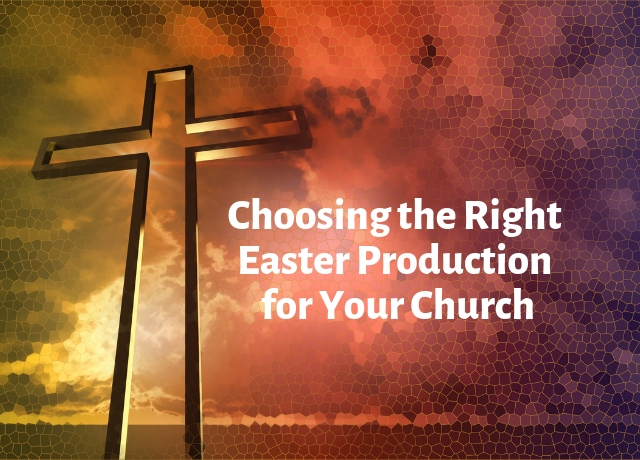 If you’re looking for ideas to put on an Easter production in your church, there are several publishers that offer a wide range of formats and themes to choose from. Select a program that will “fit” your congregation. You want to reflect the style and culture of your group and not just your personal preferences. Be respectful and flexible when it comes to recognizing different age groups and cultures within your church. It is often possible to modify productions to be more appealing to a wide range of individuals. Be aware also that some productions are written in a way that works best with large audiences, while some are appropriate for smaller audiences. It is important to recognize these dynamics and how they affect group performance. It’s important to be honest with yourself regarding your abilities and experience in choosing the right production. Your team needs a realistic view of their skills and time to dedicate towards practice. As the director, it is your job to coach and encourage your team to perform their best. Nothing kills the spirit quicker than realizing you have bitten off more than you can chew. Celebrate the season by picking a production that is moving yet accessible. If you are a smaller congregation look for simpler productions, focus on the story from the perspective of a disciple or a character. These can be incredibly moving without requiring the high budget high commitment aspects of larger and more ornate productions. When selecting your program, congregational tastes and your experience isn’t your only limiting factor. It takes a cohesive team of passionate volunteers to pull off a successful program of any type and all teams have their strengths and weaknesses. It’s important to step back and take an objective inventory of your team’s abilities. How many are capable of carrying a solo? Are your singers able to sing three or four-part harmonies? How well? Can they read or be taught SATB parts? Will the program you select be a welcome challenge or simply too much pressure? Will your vocalists dedicate the time necessary for at-home practice as well as committing to rehearsals? Will they enjoy and “invest” in the program you’re selecting? Do you have all the required instrumental parts in-house? Are your musicians dedicated enough to devote extra time above-and-beyond their typical practice load from services? Can all of your musicians read chord chords or Nashville numbers? Can your keyboard, horns, and strings players sight-read scored music? Do you have all the required microphones? Do you have enough channels available in your stage snake or mixing console? Does your technical staff have the experience to run all the A/V effects the program requires? Are they dedicated to putting in extra time for setting up the set/stage/lighting configuration and joining you for all dress rehearsals? Do you require any extra lighting? Do you require any special sound needs? Do you require special effects like a fog machine? Do you currently have a budget for your production? If your budget is less than the required, can your production still be done with excellence? Does the program you’ve selected allow enough rehearsal/planning time before your performance date? Have you informed all volunteers about the time requirements and have they agreed to them? Visual media is a powerful tool for churches when used correctly. It can help tell old truths in new ways and traditional stories in an original, creative manner. Through it all, be careful to pick videos that are excellently made but are also true to Scripture. Also, remember that videos are to help set up your service or your message. They are not intended to replace either. Thus, videos that are open-ended or leave the viewer with questions are great to use as lead-ins to a pastor’s sermon. If you need a place to start, Igniter Media has an entire library of Easter videos. If your program is not a religious service, it is not exempt from requiring performance licensing. The CCS PERFORMmusic Onsite Facilities Music License allows churches and non-profit ministries to legally play or perform more than 25 million songs from ASCAP, BMI and SESAC for non-exempt activities such as special programs, concerts, social and youth events, funerals, conferences and seminars, music-on-hold, exercise classes, and playing music throughout church facilities. The license covers church premises, which may include satellite or campus locations that are under the licensee’s legal and financial umbrella. If you want to stream your program, WORSHIPcast Online Streaming Music License is the only church streaming license that covers internet performance rights for 25 million Christian and secular songs. The easy online reporting tool allows you to browse and select the songs you stream so your fees help support your favorite songwriters. About Christian Copyright Solutions: CCS’s quest is to help churches and Christian ministries “do music right.” CCS is an expert on church music copyrights and our primary focus is providing licensing and clear educational resources to churches, as well as representation, administration, and advocacy for copyright owners. Follow us on Twitter, Facebook, YouTube, and Instagram. The information contained herein is for informational purposes only, and is not legal advice or a substitute for legal counsel.